Meade #126 x2 Barlow Lens 1.25"
The Meade #126 Barlow is a high quality compact short (2.5") unit and was designed to fit into the eyepiece holder of the Meade ETX 90/105/125 to keep the telescopes eyepiece height comfortably low. However, it can also be used in the 1.25" star diagonal of any type or brand of telescope for true 2x magnification. 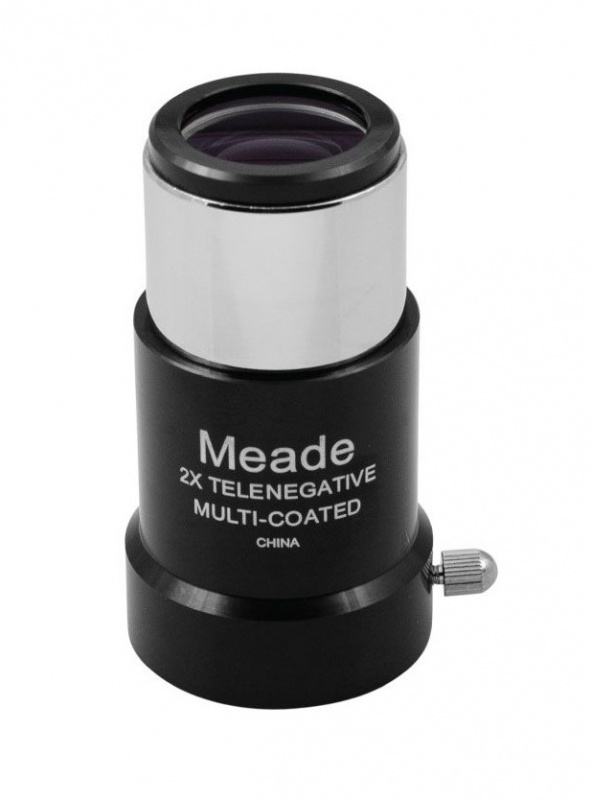 In addition to the Meade ETX scopes, it is particularly recommended for use with refractors and reflectors of F5 and above where a physically short Barlow is preferrred. It is a solution on fast reflectors to allow focus to be achieved for photography . Its multicoated achromatic glass doublet lens works best at focal ratios of F5 and above. A thumbscrew holds eyepieces in place. Meade #128 x3 Short Focus Barlow Lens 1.25"